King Danao of Argos is troubled. His brother’s Egyptian troops have gathered on his border, forcing him to suggest a diplomatic match to avoid conflict. His fifty daughters will marry his brother’s fifty sons in a mass ceremony, cementing a peace treaty between the two nations. But Danao has given his daughters secret instructions. The Oracle at Delphi has warned him that one of his nephews will rob him of his life and kingdom. And so each of the fifty girls has been ordered to murder her husband on their wedding night. Each of them obeys. Except one: Hipermestra, who loves her new husband, her cousin Linceo, and urges him to escape. Her compassion will be rewarded by a tide of blood. 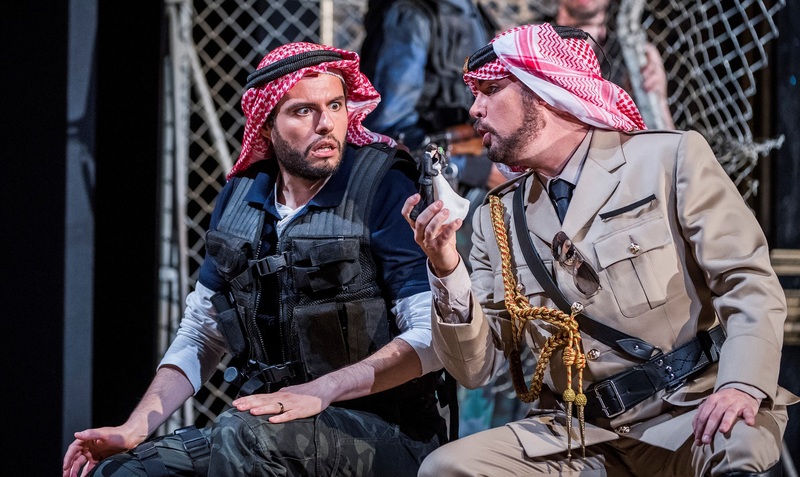 In this thrilling premiere of an all-but-forgotten opera by Francesco Cavalli, Glyndebourne have updated an ancient story to a setting in the modern Middle East, giving it a punch that lingers long after the final curtain comes down. By operatic standards, Hipermestra has an extremely simple plot. It invites us to consider the competing claims of different kinds of duty and love. Hipermestra must choose between her loyalty to her father and her beloved and, in saving Linceo, becomes a traitor to her king and country. By returning to make war upon Argos, Linceo avenges the deaths of his 49 brothers, but endangers his estranged wife and shows a bloodthirsty streak that’s rather unbecoming in a hero. And then there’s the unrequited love simmering in the breasts of the secondary characters. The Argive general Arbante (forefather to a whole host of lascivious Baroque generals) is in love with Hipermestra. He hopes that Linceo’s new status as Public Enemy #1 might encourage the princess to look more kindly on his own suit, but Hipermestra knows that her confidante Elisa is helplessly in love with Arbante and is determined to steer clear. In any case, she means to remain loyal to her husband – even if he happens to be in the process of destroying her city. Can the lovers ever be reunited? How far will Linceo go for vengeance? And how far will Arbante go in his attempts to win Hipermestra for himself? 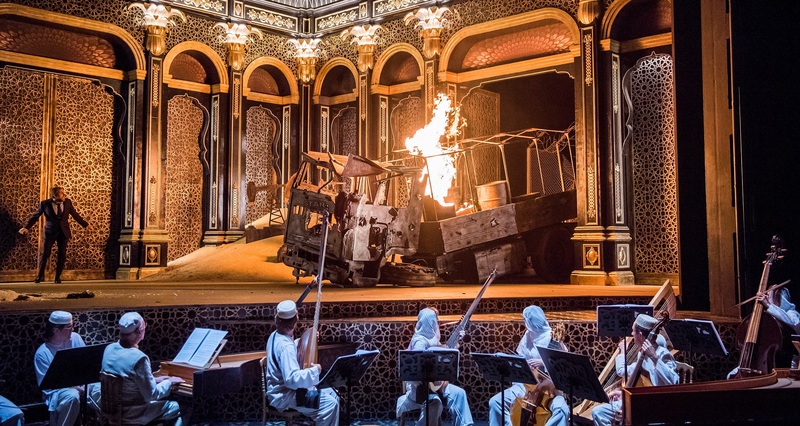 It’s become standard in recent years to update the settings of operas, especially those of Monteverdi, whose moral dilemmas are as applicable in the modern world as they were in the 17th century. Cavalli is a little more difficult to tackle. Working in the demanding theatrical world in Venice, he favoured funny, racy operas based on classical mythology, which poked fun at the loves of gods (Calisto) and heroes (Ercole Amante; Giasone; Elena). There’s usually mistaken identity; cross-dressing; a comedy nurse. The nurse remains in Hipermestra but the rest of the opera shows Cavalli in a startlingly different vein: compassionate; heartfelt; conversant with the darker parts of the human soul. There were gods in the original, but they were restricted to framing scenes and can easily be cut, as they have been here, with no loss to the sense of the plot. For this is a love story muddied by anguish. It’s a story that can make sense in any age, but it feels particularly apposite to the setting that the director Graham Vick has chosen. Hipermestra was always meant to be set in the Middle East. In the original production, the noble male characters wore Baroque approximations of Middle Eastern costume and carried scimitars at their sides. It’s not a massive leap from that to Vick’s sand-blasted world of desert, oil wells and wire fences: the innate savagery of the human soul thinly concealed by a film of extravagant wealth. Hipermestra and her sisters wear a variety of sumptuous wedding gowns trimmed with lace and ruffles; Elisa, her confidante, has a daring magenta silk suit hidden beneath her abaya and headscarf; the doomed grooms wear keffiyehs set off by gold-rimmed sunglasses and bishts over their suits; and Arbante wears army uniform with keffiyeh and dark glasses. Later, bullet-proof vests make an inevitable appearance and there are visual references – sometimes a trifle close to the knuckle – to certain terrorist organisations. But it’s an impressive concept. For those used to belcanto opera, Cavalli can be a bit disorientating. You can forget highfalutin arias and hummable melodies. That’s not what he does. As I’ve said on other occasions, his operas are dramatic rather than melodic: these are plays that just happen to be sung, and if you judge them by the standards of Handel or Vivaldi, you’re missing the point. Opera was born from a desire to recreate the experience of classical theatre, in which dialogue was thought to have been sung. We would be closer to Cavalli’s intention if we regard Hipermestra as a Greek tragedy, full of drama and gripping moral compromise. But that’s not to say that there aren’t moments of great musical beauty. Just listen to the duet between Hipermestra and Elisa in Act 2. Both in love with men who are physically or emotionally absent, they lament their situations and their voices entwine in mutual despair, layering one over the other in a plaintive refrain of ‘ecco… echo‘. Like the opera as whole, its very simplicity makes it much more powerful. And there’s one other unusual thing about Hipermestra. It’s an opera about women. They are the heroes of the piece, while the men pursue dreams of revenge, lust and blood. For once, the title character is the main character: Hipermestra is on stage more than anyone else. She’s the emotional heart of the opera, and we follow her tale of horror, kindness, disgrace and misery from her perspective. Her friendship with Elisa is the most positive and enduring relationship in the opera, as the two women support one another through the siege and fall of their city. War primarily happens off-stage: instead, we see how it affects those suffering at home. Initially I couldn’t believe that the original opera would be so focused on women. Surely Graham Vick had trimmed it, to bring this story to the fore? But no. I’ve checked and amazingly, for an opera that was originally five hours long, the only scenes cut from the original are those which featured gods, goddesses and interminable ballets. Otherwise, the libretto by Giovanni Andrea Moniglia remains intact, as the first audiences would have seen it. 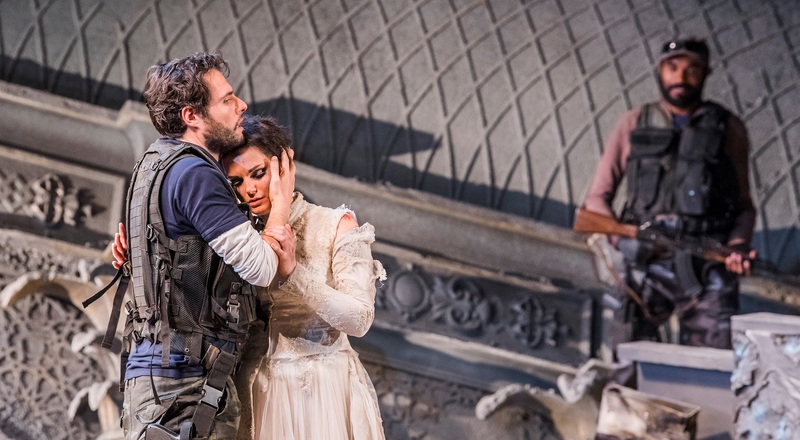 I find that rather wonderful: it makes Hipermestra one of the strongest Baroque heroines I’ve seen. The Orchestra of the Age of Enlightenment provided the bijou band under the baton of the ever-wonderful William Christie. For once, the orchestra are thoroughly engaged in the action: they’re fully costumed and, rather than being hidden away in a pit, sit just in front of the stage. Characters wander down among the orchestra while they’re singing, and two of the violinists were frequently ordered up onto the stage. And the presence of the orchestra, as part of the action, helps Vick to make a powerful point about resilience. The first half of the opera is extremely long: almost two hours before you get a break. But that means that you return from your picnic to a tremendously powerful scene: Argos ruined and deserted. There’s no sign of the orchestra. War has conquered all, it seems. The fine architecture is shattered, transformed into rubble. And then a single violinist appears on stage and begins, haltingly, to play. All is not lost. There is still music, beauty, culture, hope. And, gradually, the other musicians stumble forth from the rubble, clutching their precious instruments, and join the haunting tune. It’s a moment of genius. The cast was a mixture of established favourites and new revelations. As Hipermestra herself, Emöke Baráth displayed the sweetness of tone and vocal control that impressed me in Elena and Xerse. She’s one of the most dazzling sopranos of my generation, but she’s also a gifted actress. 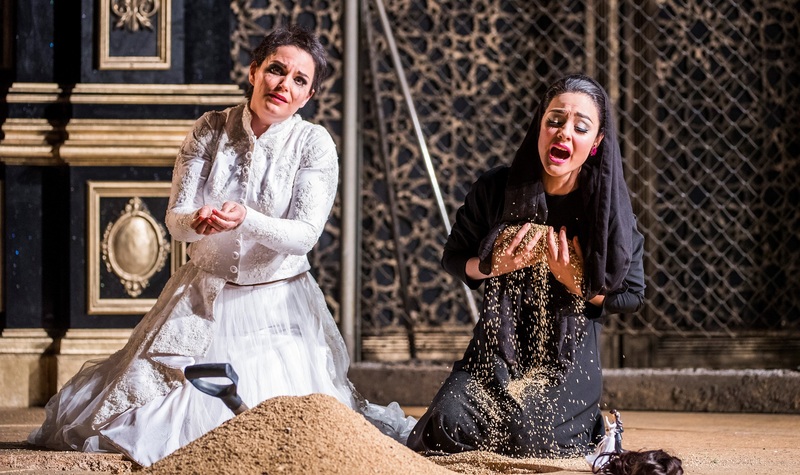 Hipermestra demands more than musical talent and Baráth gave a haunting performance as a woman scorned and shamed, yet determined to honour her oaths. She was never anything less than captivating. Her Linceo, to my surprise, was sung by Raffaelle Pé. I have two of his CDs, Bella Dama (2012) and La Lira di Orfeo (2013) and am somewhat lukewarm about them, but was unexpectedly delighted by his performance here. In the last four years, his voice has become sweet and strong, a little on the light side, but absolutely perfect for a romantic role. He’s also a charming actor: his scene in Act 1, where he anxiously gets his room just right as he waits for Hipermestra, was delightful – as was his reaction to her arrival armed with a knife. And he looked the part too: vocally he isn’t the immediate choice for a fierce army leader, but Pé’s performance in the latter part of the opera was full of vindictive fury. The tenor Benjamin Hulett (whom I last saw in Messiah at Middle Temple Hall) made a fine Arbante, giving some human complexity to a character whom it’d be easy to play as an outright villain. His journey to repentance was particularly poignant. As his devoted (but scorned) Elisa, Ana Quintans was just as delightful as she was when I first came across her as Drusilla in Poppea: her voice a gorgeous deep soprano, which played off beautifully against Baráth’s higher, sweeter tone. Again, Quintans’s dramatic conviction was hugely important in creating the strong relationship between the two women that’s crucial for giving the opera its emotional heft. I hadn’t come across the baritone Renato Dolcini before, but I thought his Danao was wonderful: an apparently reasonable man asking for the inconceivable, and wringing sympathy from the audience despite his horrific treatment of his own daughter. And finally, the nurse, Berenice! 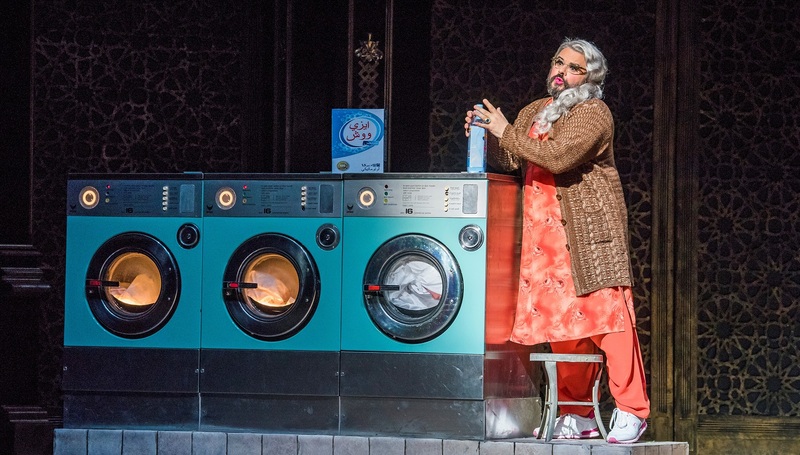 It was hard to believe that this overly camp character (played with a full beard, to openly signal the absurdity of having a tenor playing an old woman) was performed by Mark Wilde, whom I last saw as a sober, troubled Idomeneo. It’s the main comic role in the opera and, as such, sometimes feels a bit forced – I would say I found it distractingly over the top – but it’s true that we did need a bit of decompression now and again from the misery. I should explain why I was so excited about this obscure opera. The costume drawings made by Stefano della Bella for the very first performance of Hipermestra in 1658 are in the collection of the British Museum, as well as a copy of the souvenir libretto for that production, complete with fold-out engravings of the set designs. These are some of my favourite pieces in the collection and so, when I heard that Glyndebourne were putting on Hipermestra, I wrote asking if they’d have space in the programme for a short piece about the British Museum drawings. They accepted and, in return, I found myself with a wonderful seat at the final dress rehearsal for an opera I’d never seen, but which has been a huge part of my life for the past two years. So I suppose I’m not entirely objective, but at the same time, I was probably more demanding than usual. 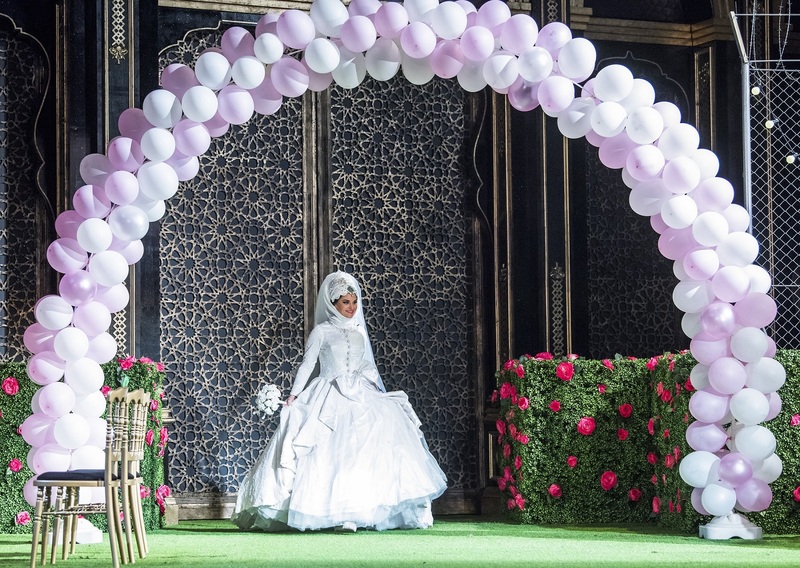 I’ll be writing more about Hipermestra soon, in fact, because I’ve just been on a fascinating journey to discover more about its first performance. But for now, I’ll simply urge you to go to Glyndebourne if you can. I don’t think there is due to be a broadcast of the opera, which is a huge shame, but I firmly hope that Glyndebourne will produce a DVD. With no recording currently available on either CD or DVD, it’s high time that more people have a chance to see this neglected opera – and especially in this thought-provoking, hard-hitting, beautifully designed production.